Going to a farmer’s market is always an adventure. I never make a list as you never know for sure what foods might be there. This is my favorite way to shop, on the fly if you will. Last week-end I picked up some leeks, artichokes, green onions, red onions and zucchini. 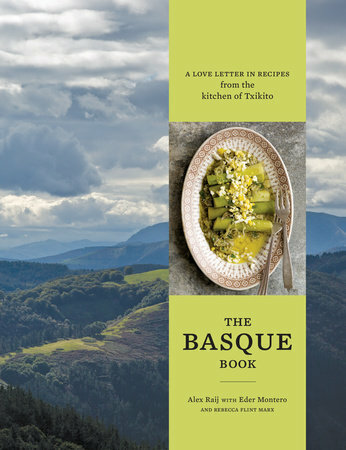 Once home I scanned the pages of my newest cookbook, The Basque Book: A Love Letter in Recipes from the Kitchen of Txikito, and oh my goodness there are so many great recipes. Let’s start at the beginning shall we. The landscape picture on the cover is just what one would expect to see if visiting the region, see picture above. The introduction talks about the authors, how they met and about the Basque culture. The next chapter is on the basics, techniques and ingredients. Then instead of the traditional set-up of chapters, starters, breakfast and so on, you get small plates, kitchen garden, eggs, cod, soups and stews, gathering and entertaining, sweets and beverages. I felt this cookbook was authentic in the sense that a single ingredient, one for example a leek can be the star of a dish. It’s simple cooking, but slow and thoughtful. One of the many recipes that appealed to me was the artichokes with lima beans and Spanish ham. Now I knew I could not immediately get my hands on the lima beans or ham in this small rural community that we are living in. But I did have the fresh baby artichokes. In this recipe the artichokes are simmered in a gentle bath of olive oil until they are tender. Which was exactly what I did. My husband declared this an amazing way to prepare this obscure little vegetable which I served with a small green salad. The second dish I prepared was the classic Spanish tortilla which is very similar to a frittata. Here eggs, potatoes and red onions are combined and poured into a non-stick pan. The technique for turning the tortilla is very interesting. When the egg mixture has set a plate is inverted over the pan and then the pan and plate are flipped together, this is done three times to get the right look. This is one method that I will need to practice, see broken omelet in picture below. Next on my list is to make the pureed leek and onion soup. 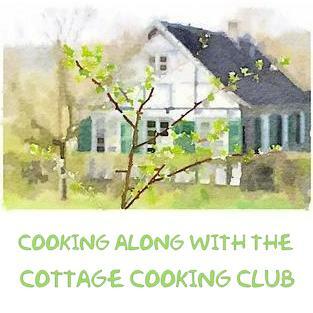 This cookbook is filled with a treasure trove of wonderful recipes and most with some sort of story behind it. A welcome addition for anyone that loves to cook for family and friends. Labels: appetizer, blogging for books, breakfast, brunch, eggs, lunch, main dish, vegetables. I normally don't take a list to the farmer's market either -- I buy what I'm drawn to! The dishes you made look delicious, Cheri! Thanks Marcie, I guess thats part of the fun figuring out what to make when you get home. Hi Tandy, I think you would like this cookbook very much. Take care and have a good week. This cook book is a pure joy! The recipes, commentary, and photos are simple honest, and quite frankly delicious. A collogue of mine was from the basque heritage and used to speak of the food and cooking tradition with such sincerity and love that this book called out to me right away, I had to find out about this treasure. And a treasure it this book is! Thanks Dliche, I agree with everything, it is a beauty. Thanks for stopping by. Thanks Dena, they were both your wonderful, love this book. These recipes looks absolutely delicious, Cheri. And the book sounds good! Thanks Anu, it is a great cookbook, with many recipes and stories to go with them. It sounds like a great book, Cheri. Both dishes look mouthwatering. I love Basque food and you picked two fabulous recipe---I love your take on the artichoke dish. So yummy! Thanks Liz, poaching in oil is new to me but we both loved it. Looks like a story of destined love all the way around! Your artichokes and frittata also sing love! #inspired ps are the artichokes from your garden? Hi Kim, no, the actichokes are actually from the farmers market. Mine are not quite ready to eat yet. 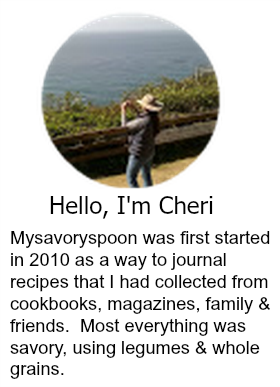 That sounds like a really interesting cookbook, Cheri! I liked learning about how they do their Spanish tortilla. I think mine would have ended up on the floor! :) That would definitely take practice. All the recipes sounded yummy. Enjoy the farmer's markets for me this summer! Hi Shari haha! if my husband wasn't helping me mine would of for sure, take care. It sounds like a good book - I love Basque food. Both dishes look delicious. I too enjoy Basque food and this book sounds like one I better hunt for. I don't think I have more than one Basque cookbook and that one is from the 60s! Thank you so much for sharing what you learned Cheri and also for introducing us to this great find! Thanks Louise, just linked up. Sounds like you have quite the collection of cookbooks! Sounds like a great cookbook! I make frittatas often and would love to try the Spanish tortilla. And I think my husband would love those artichokes! Thanks Beth, frittatas make the best meals don't they. This looks like a really good cookbook Cheri. I very much like the idea of cooking the baby artichokes in olive oil. Great Post! Thanks peggy, I have never prepared anything quite like this. loved it. The next day I poached tuna the same way, very delicious. I'm loving the sound of these recipes, Cheri. I am so ready for a new cookbook and I want something unique. Your dishes look beautiful! Thanks Robyn, this cookbook is a keeper for sure. Love Basque food! There used to be a restaurant in Reno called Louie's Basque Corner (I think that was the name) that was wonderful. No much Basque food in most of the US, but there sure is out west! Anyway, sounds like a terrific cookbook -- thanks. Hi John, don't think we have ever been to a Basque style restaurant will be looking for one now.....thanks for stopping by. Sounds like you had a wonderful time with these recipes between the farmer's market and the lovely sounding cookbook. Thanks Chris, I did. Always fun learning about new things. Thanks for stopping by Marjie, loved your dessert cookbook. I love the sound of that cookbook and am a fan of Basque cooking. Interesting tortilla/frittata - I would make such a mess! Thanks Tricia, I had the help of my husband or the eggs would have ended up on the floor. Nice review Cherie! It is a beautiful region, is it not? I think food is such a great way to get a feel for a region and this book sure makes it sound like it does just that! And those artichokes sound yummy! Thanks Abbe, yes this cookbook does a lot to showcase the region, now I want to visit. I need to get me a copy of that cookbook, looks awesome! Thanks Mike, it is awesome. Spanish Tortilla is one of my favourite Spanish dishes, I make it all the time. It is mine now too, thanks for stopping by Shaheen! My husband would love that rule, haha! But this is a great cookbook, lots of interesting techniques. I agree, Cheri! I like to shop on the fly at farmer's markets too, unfortunately ours aren't open yet. Basque food is unique, great restaurants in this area and now you have inspired me to get this cookbook. Thanks. Hi Pam, we lucked out this year as Oregon had a wet and warm winter and the market is open sooner than normal. Thanks for stopping by Karen. Have a great week-end! Sounds like a good book. Your dishes looks so delicious!